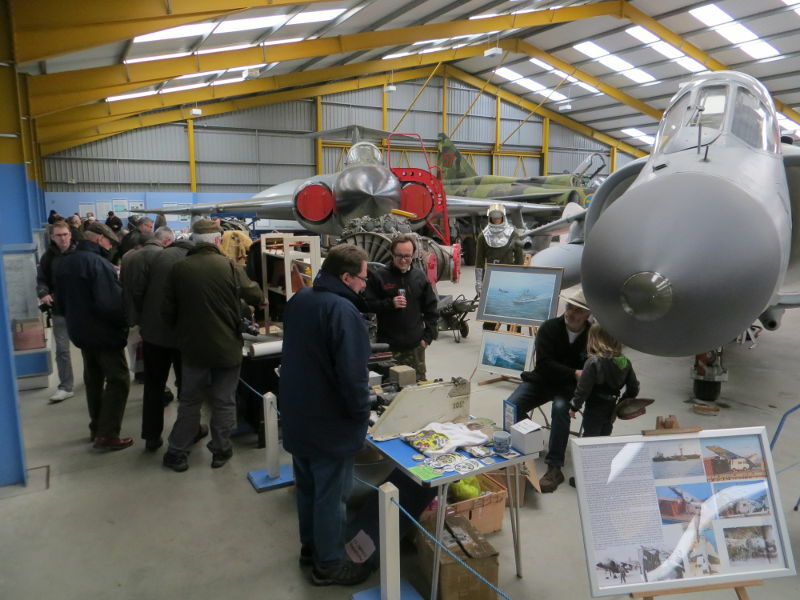 The next Newark Air Museum Indoor Aeroboot / Aerojumble Sale at the museum’s site in eastern Nottinghamshire takes place on Saturday 14th October 2017. This charity fund raising event has attracted interest from a wide range of sellers and once again is heading towards being a sell-out event. The funds that the museum raises from organising the event will be used to support the Project Panini (Mod) fund raising campaign to build new Café & Toilet facilities at the museum, which is located in eastern Nottinghamshire close to the Lincolnshire border. Around 50 tables, featuring a host of different sellers, who come from around the UK will be arranged amongst the aircraft in Display Hangar 2 at the museum. Buyers / visitors at this event will be able to access the museum site on Saturday 14th October, 2017 at a special discounted admission price of just £4.50 per person. Further details are available on the Events Page of the museum website www.newarkairmuseum.org or by telephoning 01636 707170. Aviation fans can experience the virtual skies in Shropshire next month as the Flight Sim 2017 event heads to the Royal Air Force Museum Cosford for a fifth consecutive year. 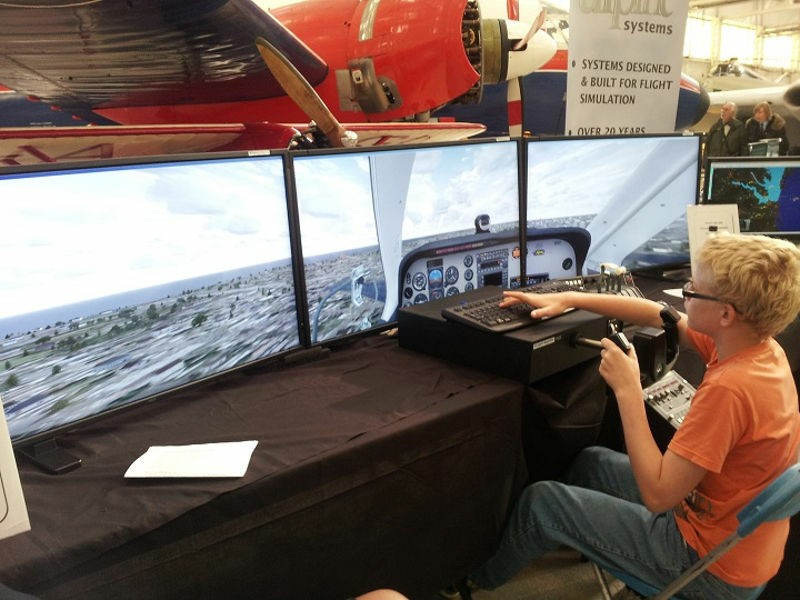 Taking place on Saturday 7 October, aviation enthusiasts will enjoy a day packed with all the latest flight simulation software and the chance to test out their virtual flying skills. After four very successful shows held at the RAF Museum, the UK’s largest Flight Sim show will be returning to Cosford for an even bigger and better event. Just Flight, one of the UK’s leading flight simulation software publishers, will be hosting this major gathering in association with PC Pilot magazine to show visitors the very best in desktop flying. Building on the success of previous events, organisers are anticipating in excess of 1,500 visitors will attend the one day show. With 34 exhibitors at this year’s event, visitors will be able to get hands on and fly the latest flight simulation aircraft, preview ‘in development’ projects, check out the latest hardware and chat with leading developers, publishers and other enthusiasts. The line-up also includes nine brand new exhibitors who will be joining the show for the first time this year. This show will take place in the Museum’s Hangar 1 from 10am until 5pm, giving visitors plenty of time to enjoy the wide range of entertainment on offer. So whether you’re a veteran desktop pilot, flight simulation novice, or someone thinking of getting airborne in the virtual skies for the first time, there will be something for everyone to enjoy. Visitors attending the Flight Sim 2017 event this autumn will experience the best of both, the virtual world and the real world of aviation, as they explore the world class collection of aircraft and exhibitions on display at the RAF Museum Cosford. Advance tickets for Flight Sim 2017 are now on sale online for just £8 per person and can be purchased up until 5 October, with free entry for under 16s accompanied by an adult. Advanced ticket holders will also receive a free goody bag on arrival! Tickets purchased on the day cost £10 per person. For further information on the event or to purchase your tickets in advance, please visit the show’s website www.flightsimshow.com. To cope with the additional visitors, a free park and ride will operate from Cosford train station with regular pickups throughout the day. Entry to the Museum is free of charge and on-site parking is available (charges apply). Entry into Hangar 1 on Saturday 7 October will be for Flight Sim 2017 ticket holders only. The inaugural Scampton Airshow has been hailed by organisers as a huge success with more than 50,000 people attending the event at RAF Scampton over the weekend. In total, 104 aircraft took part in the airshow, 41 in the flying display and 63 in the static line-up. Aerial highlights included a display by a civilian Boeing 727, an oil spill response aircraft which demonstrated its environmental capabilities by dramatically spraying the runway with water. There was also a special joint flypast by the Reds and an RAF Sentinel. On the Saturday, visitors were treated to an evocative and moving display by the BBMF Lancaster which was joined by a Spitfire and Hurricane. On Sunday, a US Air Force KC-135 Stratotanker from the New Hampshire Air National Guard performed a special flypast from its deployed base at Geilenkirchen, in Germany. The airshow climaxed on both days with a dynamic Typhoon display, performed by Flt Lt Ryan Lawton from 29 Sqn based at nearby RAF Coningsby. International participation included stunning fast jet displays by a French Alpha Jet and Belgian F-16 which raised both decibel levels and pulses around the airshow to the delight of the many visitors. On the ground, visitors could view seldom seen gems provided by Scampton-based Hawker Hunter Aviation including a Sukhoi Su-22M4, a Buccaneer and a former Luftwaffe F-4F Phantom. They were joined by a quartet of rare visitors from the Swedish AF Historic Flight. Other special guests included the Lord Lieutenant of Lincolnshire, Toby Dennis; Gainsborough MP, Sir Edward Leigh; the High Sheriff of Lincolnshire, Andrew Clark and Lincolnshire County Council CEO Tony McArdle. Representing Northrop Grumman, the airshow’s title sponsor, was John Parker, Sector Vice President, GM Technical Services. The event’s emergency services team said there were very few incidents reported over the weekend. 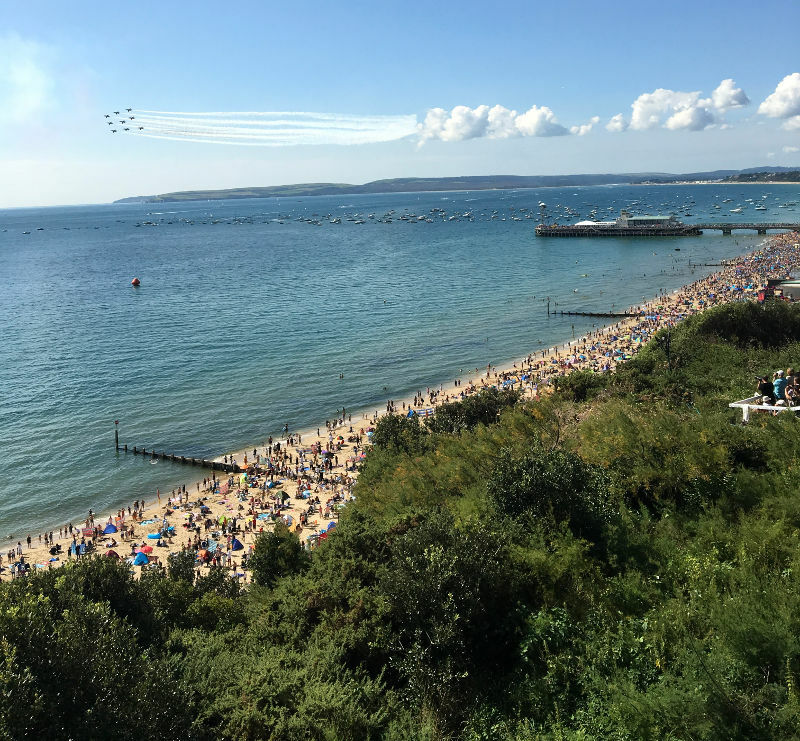 As thousands gathered for what could be summer’s last shout, the 10th Bournemouth Air Festival presented three full days of fantastic action in the air, on the ground and at sea. Taking place from 31 August – 3 September, this year’s festival featured a wide range of displays from WWII fighters and fast jets to parachute jumpers and wingwalkers. And it wasn’t just the daytime flying that wowed the crowds – dusk displays, pyrotechnics and live music meant that families could enjoy the action well into the evening. In celebration of 10 years, the award-winning event took on a very vintage feel – with historic aircraft across the weekend and culminating in a display of classic cars on the East Overcliff..
Now in its 10th year the event is stronger than ever with its value to the local economy estimated at more than £31million per year supporting 500 full time jobs. Records were broken with more than 15,000 ice creams sold in one day, an estimated 1,020 boats in the bay recorded by HM coastguard and approx 450,000 festival goers who attended ‘Super Saturday’. 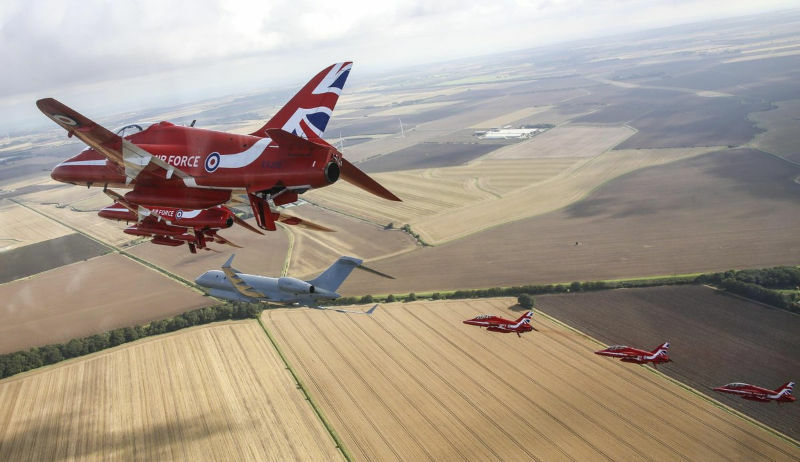 Mark Smith, Director of Tourism for Bournemouth, said: “The enduring success of the BAF is down to three things, having the world’s finest display arena, the amazing talents of the pilots and display teams and the wonderful support of the Armed Forces. Despite a few scattered showers on the first day, all programmed displays took place as aircraft fans welcomed back festival favourites including the Blades, the Royal Air Force Chinook Display Team and aerobatic pilot, Gerald Cooper. Day one signed off in style with a performance from HM RM Band Collingwood in the Lower Gardens’ bandstand and live music on the beach. The hot weather continued into Saturday, providing breath-taking views across the bay and the perfect backdrop for spectacular feats of derring-do. Firm friends of the festival the Tigers Parachute Display Team were back once again diving onto Bournemouth’s golden sands from knee-trembling heights and a solo Breitling Wingwalker limbered and flexed through the clear blue skies. As well as the popular Red Arrows, high speed fun continued with jets including the MIG, Vampire Pair, Strikemasters and, back for the first time since 2009, the Russian Yakovlevs performed tandem twists and turns above the sparkling sea. Dusk displays returned for another year with the Twister Duo, Otto the Helicopter and the Red Devils Parachute Regiment performed magical pyrotechnic displays against the weekend’s clear moonlit skies. Live music stages starring tribute acts and party bands, as well as children’s entertainment in the Lower Gardens and fireworks in the bay, completed the 2017 Night Air programme. The forecast rain and high winds eventually set in on the final day but didn’t dampen the festival feel. The Royal Navy carried out their final amphibious beach assault demonstration and those who braved the weather, saw a selection of classic motors on the East Overcliff. Although Sunday’s flying programme was cancelled, the spirit of the wartime tribute had already been honoured with a huge variety of historic aircraft across the weekend. Hordes of enthusiasts had already seen a Hurricane, Spitfire, P-51 Mustang, the ever-popular Sally B and a Blenheim featured in recent Hollywood blockbuster, Dunkirk. The Great War Display Team also put on a magnificent show in their flying machines on both Saturday and Sunday. As ever, armed forces support for Bournemouth’s biggest event was evident with military personnel and assets across the resort. The Royal Marine reservists’ impressive amphibious beach assault demonstrations were supported by the Royal Navy’s Primary Aviation Training Ship and Primary Casualty Receiving Facility (PCRF) RFA Argus, as well as Hawk jets and a Wildcat attack helicopter. The Band of Her Majesty’s Royal Marines Collingwood also performed musical extravaganza, the Beat Retreat sunset ceremony, on the East Overcliff. Overseeing his last BAF before retiring from the Navy after a 48-year career, Commodore Miller Royal Navy Regional Commander said: “I leave this role as Naval Regional Commander since 2004 with a legacy of which I’m proud. “This major high profile event in Bournemouth is an important national public occasion for the Navy. It gives us, in uniform, the chance to tell the public what we do and why. Bournemouth Air Festival is back again next year and dates are 30 August – 2 September 2018.